A richly tempting Borders derby is the pick of the fixtures this weekend in BT National League Division I, as Selkirk take on Jed-forest. 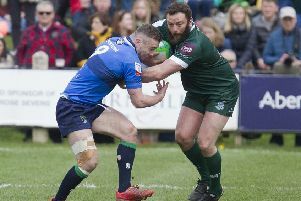 The Philiphaugh hosts have recently been stringing some good results together, despite being ravaged by injury, and expected a win last Saturday to carry them confidently into this game. However, despite victory with six tries, they were unhappy with aspects of their display against Howe of Fife. Jed-Forest, on the other hand, saw their 100 per cent winning record disappear last weekend against Marr. But they hope that, rather than signalling a slump in form, the setback will propel them on to recapturing winning ways. Both sides are looking forward very much to the game, knowing the local rivalry will give it an extra dimension. Jed-Forest head coach Jammy MacFarlane said it was extremely difficult for his side last week in Ayrshire, with Jack Sudlow sent off after barely five minutes and two other players yellow carded as they went down 26-19. “It’s tough enough playing through there with 15, never mind 14, and then twice with 13,” he said. He added: “It will be extremely difficult – Selkirk is always a very difficult place to go – and the Border derby will be raging on. “They are different games, without a doubt, but it’s another national league game. Last Saturday, Selkirk were behind against winless basement boys Howe of Fife until the last 10 minutes, bagging a couple of tries to win 36-31. However, manager Tom Ramage said they had been guilty again of making a sluggish start, while indiscipline, in the form of fouls in rucks and mauls – had cost them 12 points. While it wasn’t the performance-led victory they wanted, Ramage said he was nevertheless looking forward to “a good Borders derby game”. He added: “It will be a close game – I think it will be a case of whoever wants it will get it. “We have home advantage and that could tilt it for us. Influential prop Lwando Mabenge is out with a broken shoulder but Craig MacDougall and Josh Welsh could return for Selkirk.